Hounkiar Begendi (Hünkâr beğendi) is a Turkish dish with stewed lamb or beef, served on a bed of creamy eggplant puree. This recipe literaly means “the sultan was satisfied”. The French chef serving sultan Murad IV (who was sultan from 1623 to 1640) , combined his knowledge with French cuisine to prepare a dish which would satisfy the sultan and he fully succeeded, creating this delicious dish. This dish was made popular in Greece, when the Greeks of Asia Minor were forced to leave Turkey and come to Greece. I learned about this recipe from a friend, whose grandparents were from Constantinople. This dish is made either with lamb or veal but the star of this dish is the eggplant puree. I made several changes to the original recipe. The eggplants are charred until the flesh acquire a smokey taste. Then a roux is made together with the salt and spices. I also added some cumin together with the nutmeg. The flour was roasted in olive oil until the flour started lightly browning, which always gives an amazing taste to the bechamel. Then the eggplant puree was mixed in the bechamel, as well as some cheese. The traditional cheese used for this recipe is either kefalotyri, kaskavalli or even kasseri. This time I made it with Pamigiano Reggiano which added a wonderful taste to the puree. When I bought the veal I was planning to make a different recipe. Instead of cutting the meat into small pieces, as stated in the recipe, I cut it into thin slices of about 1 1/2 cm, which I dredged into flour. I made the veal stew using more spices which I usually add when making stews, such as a cinnamon stick, all spice berries and a bay leaf. My children do not like garlic so I reduced the amount from 3 cloves to 2. Also instead of adding sugar to the sauce, which I usually avoid and instead I usually add honey, on that day I had made some apple sauce, which I used instead. Instead of adding concasse tomatoes, I added passata as well as tomato paste and water. By adding the tomato paste and water there was leftover sauce but I do not regret it as it was really delicious and I made good use of it. I was surprised to see my daughter adding some of this sauce to her toasted sandwich. The rest was used a couple of days later to make a quick chicken stew. All I did was to cut the chicken breast into very small, thin slices, I added salt and pepper and sauteed the chicken. Nothing else was needed but the leftover sauce and the meal was ready in fifteen minutes. I served it again with eggplant puree and accompanied it with rice pilaf. I boiled some broccoli florets for three minutes which I put in iced water immediately. I then cut the florets into smaller pieces and I mixed it in the rice together with some crumbled feta. This is surely a dish which I will be making over and over again. Wash the eggplants and pierce them with a fork all over. Char the eggplants over open flame until black outside or place them on a baking tray and bake for about 1 hour turning once. Turn them over half way through. Set aside to slightly cool and purée in a food processor. In another pot heat the olive oil, add the flour and spices and stir with a balloon whisk to prepare the roux. Pour the milk and keep stirring with the balloon whisk. When it starts thickening, add the mashed eggplants as well as the parmesan and mix well until incorporated. Remove the purée from the heat and serve as a side dish. Simultaneously you can start cooking the meat. Wash and cut the veal into small pieces or thin slices ​​ 1 ½ cm thick. Season with salt and pepper. Pour the flour into a zip lock bag and dredge the meat, a few pieces each time. Heat the olive oil in a frying pan and sauté the meat on both sides. Do not put too many pieces in the frying pan. Remove the fried meat in a pot and continue frying the remaining. After removing the meat, add the onion and sauté until translucent. Mix in the garlic and sauté for 1 minute. Pour the onion with the olive oil in the pot with the meat. Put it back on the heat and add the wine. Boil for a few minutes until the alcohol evaporates and add the apple sauce, tomato paste and tomato passata as well as all the spices. Fill the carton of tomato with water and add to the pot. Put the lid on and when it starts boiling, reduce heat and simmer until the meat is tender, about 1 hour. Taste and adjust salt. Just before the meat is cooked prepare the eggplant puree. 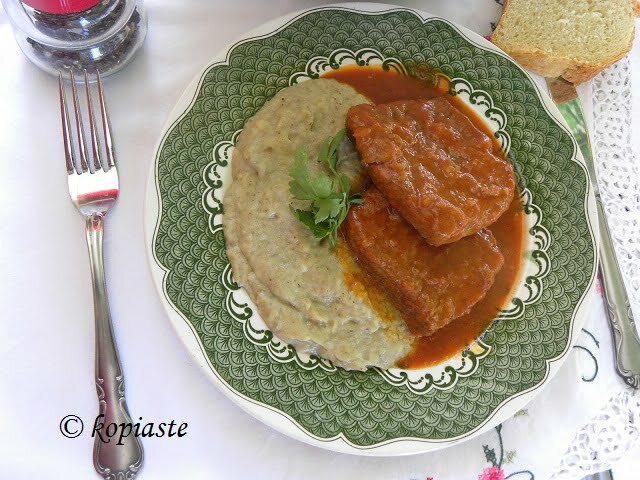 Hounkiar Begendi is a Turkish dish with stewed lamb or beef, served on a bed of creamy eggplant puree. This recipe literaly means "the sultan was satisfied". Wash and cut the veal into small pieces or thin slices 1 ½ cm thick. Season with salt and pepper. Pour the flour into a zip lock bag and dredge the meat, a few pieces each time. One of my favorite dishes! Your houkiar begendi looks delicious. I love eggplants this way , In India we have a dish called baigan bharta which is basically mashed eggplant and we loved it the way my mom used to make it and she told the trick to get it taste really good was to grill over file till the skin is charred. So, just what you say too. I can see it is full of flavours…wishing you happy Pentecost! It looks like a great meal. I need to make some eggplant puree soon. Love the stuff!